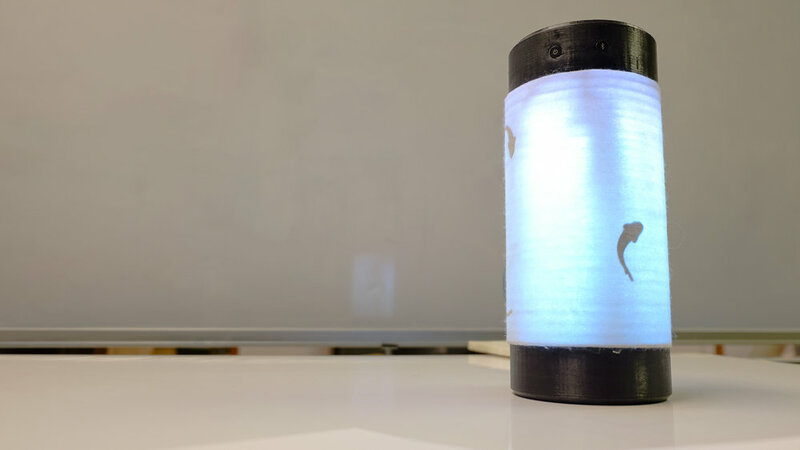 A Jar of Time is an Arduino-powered timer that gently reminds people a passage of time through incrementing light. I sketched the form during the ideation process. We experimented with various light colors and chose a gradient blue and green, which simulates different layers of water. To further such visual narrative, we sticked fish silhouettes on the body of the jar. The pulsing light thus looks like water flow with the seams between acrylic rings. This form factor makes the jar more desirable by enriching the user experience with the jar. I name it “A Little Jar of Time” since I aim to express an alternative unit of calculating time. 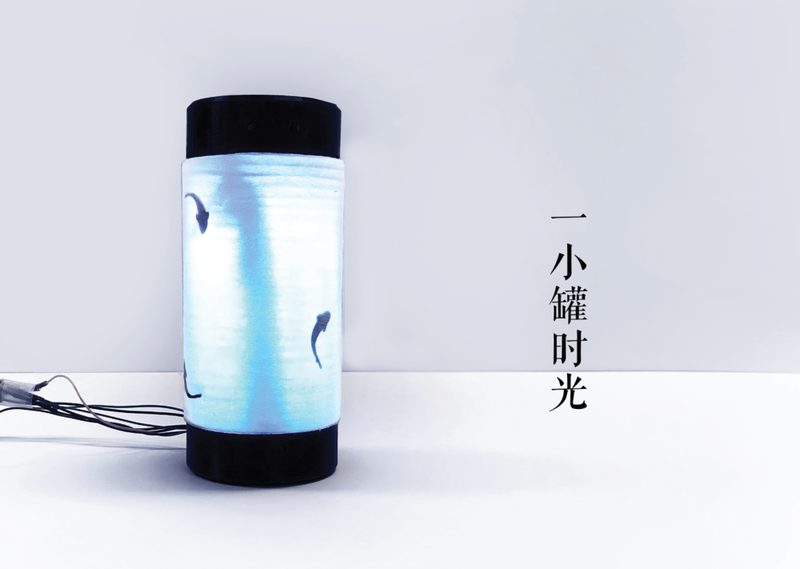 The Chinese title in our poster, “一小罐时光” (Yi Xiao Guan Shi Guang, A Little Jar of Time), refers to the metaphoric relations between time and light. In Chinese, the compound word “Shi Guang” is used to indicate time, while the literal translation of “Shi” is time and “Guang” is light. Thus the choice of using light to simulate time is not only due to functional considerations of visibility, but also due to my intention to address a poetic expression in Chinese language. Instead of using sound or blinking light, we use incrementing LED lights to indicate time. The jar will be completely lighted after a preset amount of time. The user's workflow won't be interrupted when time is up. The tilt sensor inside the jar enables the user to reset the timer by inverting the jar. After being inverted, the light will increment from the bottom again. The resetting feature is especially useful in presentations or meetings, where each speaker has an equivalent amount of time. After the user connects to the jar by pressing the Bluetooth button, the user can set a desired interval of time under 24 hours. After an interval is set, the user presses the power button to start the timer, and presses the power button again to turn it off. 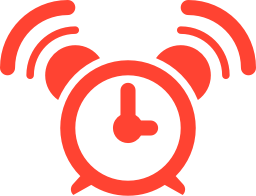 Setting a timer is common in everyday scenarios - in presentations, meetings, and at work. However, in some scenarios digital timers might increase anxieties triggered by a precise digital display of time or an alarming sound. In the scenario of meetings and appointments, we observe that speakers need to keep track of time during conversations. Yet setting an alarm after 20 minutes would interrupt the conversation flow awkwardly and might be offending to the speaker. The speaker, on the other hand, cannot keep track of time easily when giving a talk. A timer on a phone is not noticeable all the time. Another scenario is to keep track of time without interrupting one's work flow. In our user testing, one of the user mentioned a need to set a timer in a quiet library in order to switch to another task at certain time. His alarm sound was so loud that he felt others were disturbed by the sound. During our interviews with people with professional working experience, we notice that these users don't wish to know a precise duration of time when concentrating on tasks. 1 or 2 minutes' delay to finish the last sentence/step would not hurt, and an alarm sound was nerve-racking. A less intrusive way of communicating time is desired. We thus decided to design a simple, useful tool that indicates a passage of time visually. In this design, we aim to solve the above issues, especially targeting providing a more productive environment for users. In the use cases of our storyboards, our target users can focus on their work or conversations and experience less stress when talking or working. The primary inspiration of A Lil Jar of Time is drawn from Pomodoro Technique, which is a time management method developed by Francesco Cirillo in the late 1980s. Cirillo proposes using a timer to break down work into intervals (usually 25 minutes) since people can only be focused and efficient within a certain period of time. However, according to the recent neuroscience research everyone's attention span varies. We consulted Jon Froehlich (the instructor of the class) in terms of the technical feasibility. He kindly recommended us using individually addressable LED light strips, which we could manipulate creatively through Arduino (based on what we learned in this class). Our challenge thus becomes a specific execution problem: how might we use light strips to indicate a flexible interval of time? We ideated various forms of the jar, considering shapes that simulate an hourglass. Xinbei's early sketches of possible forms. I made the early prototypes and tested them with 3 people. 1. Whether the light moves downward or upward would not alter the perceptions of time. 2. Light rings and light blocks give a clearer sense of unit when participants trying to measure time. 3. Gradient pulsing light gives a sense of peacefulness. After reporting the results to my teammates, I suggested going with mode ❸ because of the reasons above and more importantly, light rings work better in a 3D interface since any change of light rings looks exactly the same from any perspective, while light blocks work better in a 2-D interface. However, the gaps between the light rings made this process look disrupted and less continuous. Thus, after some discussions, we planned to create a shell that evenly diffuses light into rings. Xinbei and I measured and planned the specs. Considering the size of each LED light on the strips, we had to keep the jar at a certain height so that the incrementing light is visually clear. We also need to measure the size of the tactile buttons in order to find a proper place on the jar. At first we intended to put the buttons on the top of one base, yet considering the resetting function, the buttons would be facing downward on the table. We thus decided to put the buttons on the side of one base. We did not consider the possibility of putting buttons on both base caps considering technical limitations. After we measured and calculated the closest distance between lights with desired incrementing effects, we customized a foam accordingly and taped 2 LED strips on it. We also designed the diffusion of light by trying multiple distances between different materials and the light strips. We chose mulberry paper considering its organic look and texture. The closest distance to reach a desired diffusion effect is 12mm. After all this work, we concluded that the inner diameter of the jar should be at least 80mm to fit everything perfectly. We decided to build the entire body of our design from scratch since getting a jar of exactly the desired size and texture (evenly distributed rings) is too difficult. 27 * 0.22 inch = 5.94 inch, which is the measured height of the jar's body. We sandpapered the surface of the acrylic rings, preparing for gluing. After applying some silicone sealant, we use bar clamps to secure acrylic rings tightly together to prevent movement. Finally we used a box to add inward pressure to the entire body. To implement the feature of light rings without gaps, we laser cut 27 rings on a 0.22 x 18 x 24 Clear Acrylic Sheet and glued them together to build the body of the jar. As stated in the design process, diffused light rings can clearly communicate a visual difference of incremented light. In other words, this structure makes each increment of light more obvious and continuous. Aesthetically, this structure creates an effect of water waves when light fills a part of the jar. After Victoria powered the light strips with Arduino code, the light can fill the jar by a preset amount of time. We recruited 1 female and 3 males for our prototype test session. Our participants range in age from 20 to 30 years old. 1 is a student from UW; 3 works in Seattle based companies. We recruited these four people because of their level of technology literacy. All of our participants have professional working experience. Before the test, we asked several background questions in terms of their everyday behavior when busy with work or talking to someone. After the jar was preset for 1 minute, we compared 2 modes of light by asking our participants to 1) spot differences in given pictures and 2) talk to the moderator about their work. For each of the task, we asked the participants to turn on or reset the jar and remind the moderator when time was up. At last, we debriefed and asked if they have other comments about the form factor of the jar. 2 Modes of Light: Prototype A: Light rises up from bottom to top and gradually fills the whole bottle. When time is up, the pulsing light lasts until the user turns it off. Prototype B: Light rises up from bottom to top. When time is up, the light turns off automatically. 1) Power button's position and type should be reconsidered. When I asked the participants to turn on the jar, 3 out of 4 needed my guidance to "press harder." P3 and P4 used both hands to press the power button. P2 at first tap the top of the jar to switch on, and P4 verbally expressed the same intention. I inferred that the button should be tappable on the top and bottom of the jar. When I asked the participants to flip the jar to reset, 4 out of 4 expressed different levels of compliments. However, in the debrief session, 3 out of 4 mentioned that the jar was too big to be inverted easily. As shown in the photo above, P2 and P4 used both hands to invert the jar. P1 mentioned that when he inverted the jar with one hand, he wished the shape was a concave to be grabbed steadily. 3) Participants did not notice that time was up until they finished the tasks in both prototypes. As the above shows, P2 was focusing on the given task and did not notice time was up with both prototypes immediately. Whereas when talking to the moderator, he ended the conversation when he noticed that time was up. P4 had a similar experience. P2 and P4 claimed that they preferred Prototype B because it was more obvious to them. 4) Participants could not tell if time was almost up or already up by looking at Prototype A. Because of light diffusion, participants were not sure whether the jar is completely or almost full of light in Prototype A. As the above shows, after finishing the task (spotting differences), P3 constantly looked at the jar when time was almost up - he even leaned his head, trying to see the light clearly. P1 had a similar experience, yet P1 and P3 claimed that they preferred Prototype A because they were not sure if the jar was broken when Prototype B turns off the light automatically. Prototype B might made users question the reliability of the system constantly, which is a severe usability problem. 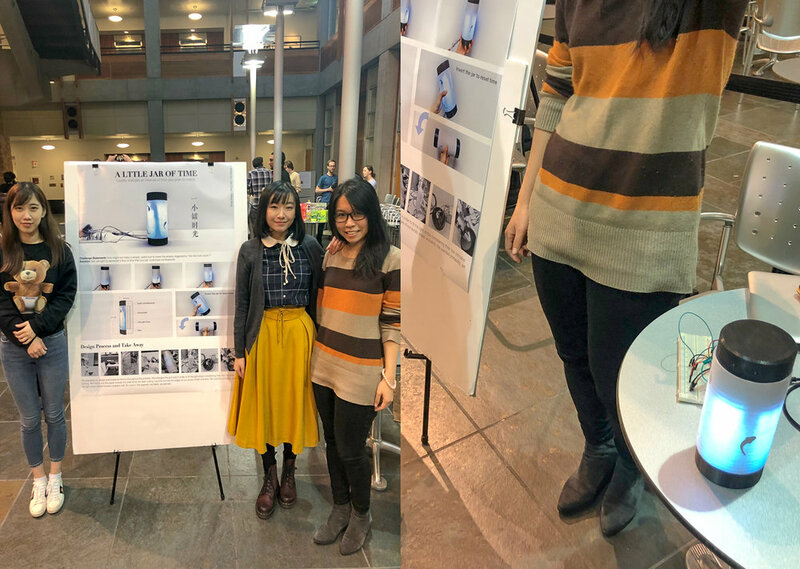 Our work is selected to be presented at the annual UW Maker Summit! Come and join us.